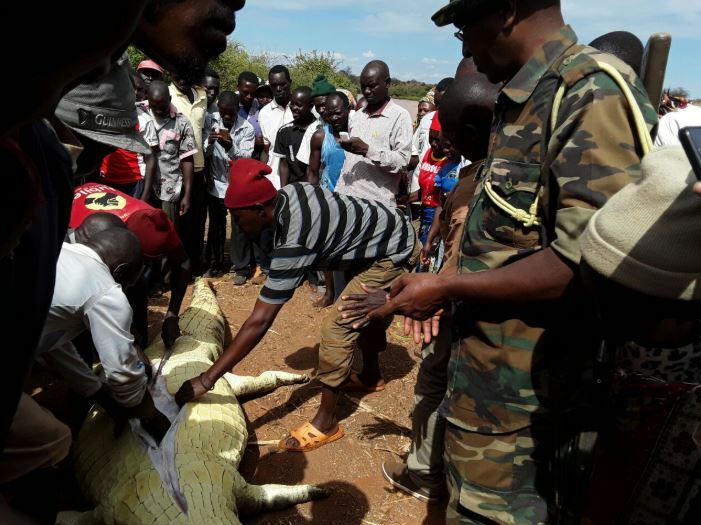 Kenya Wildlife Services wardens have killed a crocodile and slit open its stomach in search of a body of a girl who was reportedly mauled by reptiles at the Kiambere dam in Karura village, Embu County. Mawia Mwendwa King’ola, a Standard Two pupil at Karura Primary School, had been sent to fetch water at around 6 pm on Tuesday when the attack is said to have happened. Kiambere MCA Lenny Masters Mwaniki said residents saw two crocodiles pull the 10-year-old girl into the water before they started pelting them with stones. The Ward Representative said he had contacted the local Kenya Wildlife Services officials who started a rescue operation on Wednesday morning. The KWS officials, with help from locals, managed to kill one crocodile before cutting open its huge stomach in search of the girl’s remains. They did not find the girl’s remains. The incident has sparked reactions from Kenyans who accused the embattled KWS of incompetence in the handling of the matter. “Are you still going to tell KOT to go to hell after this? Umemaliza rhino Sasa umeanza crocodiles!!! !” another asked Wildlife CS Najib Balala. “How stupid can we be..?? It’s now nauseating,” another exclaimed.